Dental Select Chief Marketing Officer, Thomas Nehren, started working at Dental Select four years ago. On his second day, he began the process of updating the company website. Late last week, that vision finally came to light when Dental Select launched its brand-new website to the public. The site is designed to offer easier navigation, expanded sales content and a new, more contemporary design to go along with the new Dental Select brand which was launched over a year ago. One widget that Nehren and the Marketing Team are excited about is the “ChatBot.” This was implemented to work as an expedited search function. The idea behind this integration stemmed from Alexa, Siri, and other audio integrated-driven technologies. The new function lives on the homepage to help people get to their point of interest quicker. As Nehren emphasized, unlike Nike, Amazon or other shopping sites, a dental insurance visitor isn’t coming to browse the site. They have a purpose and are more often than not, looking for something specific. This new Chatbot, will help them get to the right place, faster. Among helping its four main audiences (brokers, members, group administrators and providers), the new website will also benefit the hard-working employees of Dental Select. In years past, the website has worked as a great file repository for those in the Dental Select office. It provided quick, easy access to important common forms. 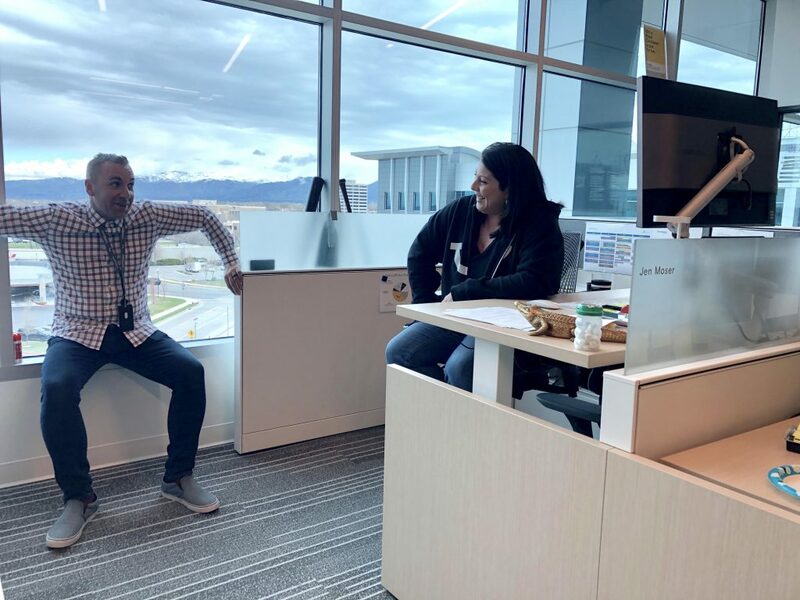 Two months prior to the new website launch, the Company announced a new intranet to provide easy, organized access for employees. 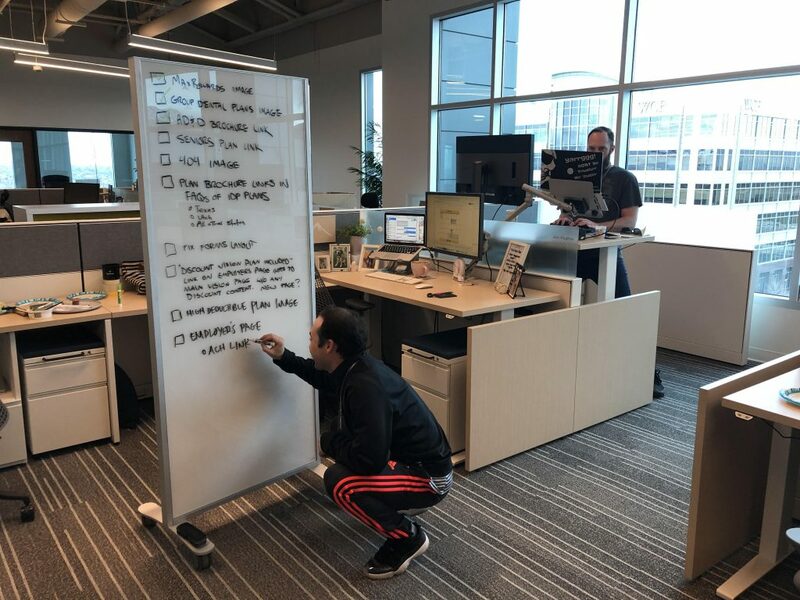 With a new organized employee form hub, the web team was able to focus all their attention to the needs of the customers for the new external-facing website. Thomas Nehren and Jen Moser discussing the new website. The next project on the Marketing Team horizon is a new portal system. The portals that exist today, will continue to exist on the new website until the launch of the new system, Passport. With Passport, customers will be able to navigate around easier and quicker. The new portals are also designed to look and function the same across various platforms; desktop, mobile, App, etc. This way, no matter which platform a customer is working with, they will all be the same. For a company looking to grow their new brand with awareness, consistency and functionality, this will be a huge step in the right direction. Self-funded vs Fully Insured Dental Plans: Which is Right for Your Company?